Wow… it was love at first sight! 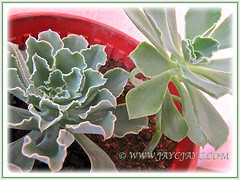 This strikingly beautiful Echeveria ‘Blue Curls’ truly caught our attention from afar when we visited the Cactus Point in Cameron Highlands during our vacation in August last year. This particular plant stood out adorably among the many potted ones that were available for sale. We bought it for a steal, just RM12! We considered it very cheap as the pot had two plants and two spikes of flowers. A truly enchanting and remarkable beauty! Common Name: Mexican Hen and Chicks. 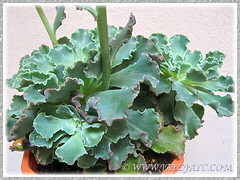 Etymology: The genus name, Echeveria was named after Atanasio Echeverria y Godoy, the 18th-century Mexican botanical artist and naturalist. The species epithet bracteata means having bracts, referring to its attractive and conspicuous bracts. Origin: Native to semi-desert areas of Central America, from Mexico to northwestern South America, though this hybrid, Echeveria ‘Blue Curls’ is noted as the sister seedling of the cultivar, ‘Blue Waves’ that was hybridised by Frank Reinelt. 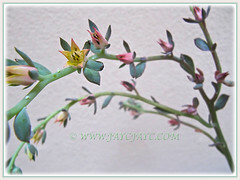 Plant type: An ornamental perennial succulent shrub. Features: Echeveria ‘Blue Curls’ is an attractive hybrid of the genus, Echeveria that consists of more than 2000 species of flowering plants. Generally. Echeveria are popular and extremely valuable succulents for their stunning colours and variation, prized by collectors and gardeners alike. The hybrid, “Blue Curls’ is very fascinating evergreen perennial with frilly-edged silvery-blue to blue-green leaves that have edges in showy pink hues. 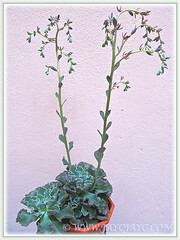 A hardy plant with stems and leaves that are thick and fleshy, eventually forming rosettes that are more or less about 10-20 cm in diameter, somewhat similar to a cabbage. Occasionally it produces pencil-sized flowering spikes with reddish-pink to hot pink and orangy bell-shaped flowers that are well spaced along the 30-50cm stalks. These undulating and arching stalks can last for a long time. 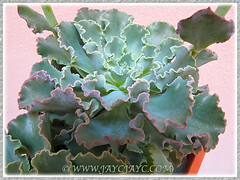 Culture (Care): Echeveria ‘Blue Curls’ grows easily with minimum care. Light: Full sun but not blazing hot, for best growth and vibrant pink edging at the leaves. Moisture: Low water requirements and drought tolerant, although it does well with deep watering when the top soil is dry for a week or less. Soil: Grow in well drained soils, sandy or gritty soils. 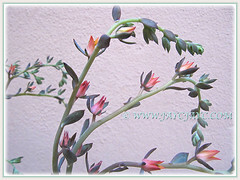 Cacti-and-succulent soil-based potting mixture is suitable too. Others: Feed once monthly with a balanced fertilizer. Remove leaf litter that collects in the crown to maintain a pleasing appearance. Generally free from garden pests, but do watch out for mealybugs that are attracted to them if plants are overcrowded and lack ventilation. For subtropical and temperate regions:Hardiness: USDA Zone 9-11. Winter hardy to -4°C (25°F). Best to plant them in pots so that you can protect them when frost threatens. In summer, water regularly, but at cooler winter temperatures only occasional watering is needed. Best to propagate them in spring as growth starts. Propagation: By leaf or stem cuttings, and even by cuttings from offsets that appear along the parent plant’s trunk. Also by dividing and potting up offsets from clump-producing plants. 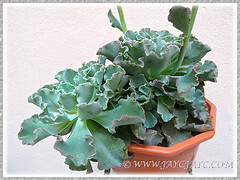 Usage: Echeveria ‘Blue Curls can be grown in pots or in the ground. It is ideal as a ground cover which will in due course form clumps of closely growing plants, making them a dramatic addition to your succulent garden. This hybrid can be grown in any rock and desert garden with more watering during the summer growing season. Also, grown in a large and shallow container with a crowd of other colourful and drought-tolerant succulents will make a attractive display. It is suitable too indoors in a greenhouse provided given sufficient sunlight and brightness. Plantes Grasses Frontignan, including images of other Echeveria cultivars/hybrids. Dave’s Garden, by Geoff Stein (palm bob) who posted his personal gardening experiences in Southern California. Check it out – very interesting and informative. Gong Xi Fa Cai to you and your family too, Jacqueline. May good health be with you, always! Ahhhh these always tempt me too. Im wondering will they survive the wet season in the tropics? I’ve tried quite a few succulent things which seem very popular these days but they alway rot away. Maybe the intention is for indoor gardens or covered areas but there is a spectacular number of them in our stores, usualy tiny little plants. This one would look so nice planted in masses in a big pot just on its own. I love that curly textured happening, like a coral in the sea. Spot on, Anton… they do look like sea corals though colour confirm otherwise! Our plants are located at the porch and somehow they have lost their pinkish edging and basal leaves appear to wither somewhat fast. Probably, they prefer a more sunny location.